What could be better than an intelligent, high quality new movie in the tradition of classic British horror, with familiar faces among the cast and set in a spooky old mansion? How about a large format graphic novel version of that movie, based on stills from the film? 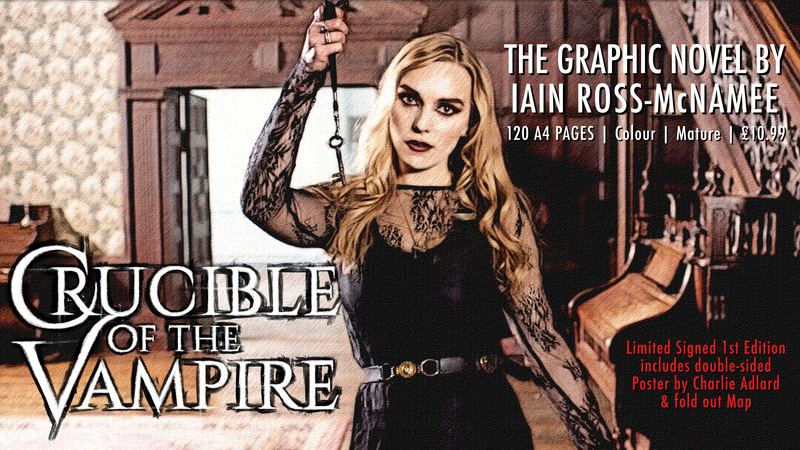 This is Crucible of the Vampire – a graphic novel (or perhaps more accurately photo-novel) by Iain Ross-McNamee, who co-wrote and directed the 2017 film, starring Neil Morrissey, Katie Goldfinch, and Piece of Pink Pie interviewee Florence Cady. The story tells of a university researcher investigating the history of a mysterious artefact at a manor house in rural Shropshire. She discovers that the house holds a dark secret, and the family are not the only inhabitants. There’s much here to appeal to lovers of vintage Hammer horror – especially the mysterious old manor house and the ‘frisson of lesbian vampire eroticism’ as Diabolique magazine puts it. But it also harks back to the British folk horror tradition – the story begins in the English Civil War, bringing to mind the likes of Witchfinder General and The Blood on Satan’s Claw. You don’t see many graphic novels of films these days (or at least I don’t – perhaps I’m not looking hard enough), so the format seems nostalgic too. It’s an ideal way present a film which has so far [I write this in October 2018] only had limited release [though I’ve just heard it will be in some cinemas in February 2019]. It also allows some quirky extra features. So we have some inserted pages from Living in Shropshire magazine (with a feature on this manor house, Ashwell Hall, and the Scott-Morton family who live there) and a map of the village, with some significant annotations. The 120-page book is published by Ghost Dog Films for £10.99 and is available from Amazon and elsewhere. It even has its own trailer. And if you’re interested in the film, as I am (the graphic novel is as close as I’ve got so far), here’s its IMDb page and here’s the trailer. In case you missed it, this is my recent [July 2018] interview with one of the film’s (and book’s) stars, Florence Cady. Tags: English Civil War, Florence Cady, Ghost Dog Films, Iain Ross-McNamee, Katie Goldfinch, lesbian, Neil Morrissey, Shropshire, The Blood on Satan's Claw, vampire, Witchfinder General. Bookmark the permalink.